Washington - Sen. Bernie Sanders’ tax and spending proposals would provide new levels of health and education benefits for American families, but they’d also blow an $18-trillion hole in federal deficits, piling on so much debt they would damage the economy. That sobering assessment comes from a joint analysis released Monday by the nonpartisan Urban-Brookings Tax Policy Center and the Urban Institute Health Policy Center, well-known Washington think tanks. The bottom line: Democratic presidential candidate Sanders would raise taxes by more than $15 trillion over 10 years, with most of that paid by upper-income earners. But that wouldn’t be enough to cover the cost of his proposed government-run health care system, along with free undergraduate college, enhanced Social Security, family and medical leave, among other new programs. As a result, Sanders would add $18 trillion to federal debt over a decade. In a statement, the Sanders campaign said the analysis “wildly overestimates” the cost of the Vermont senator’s health care plan. The campaign also said the analysis “significantly underestimates” health care savings through less bureaucracy, simplified paperwork and lower prescription drug prices, similar to what other countries with government-run systems have achieved. “If every other major country can spend less on health care and insure all of their people, so can the U.S.,” the campaign said. However, if the critics are right, one likely consequence would be that a President Sanders may be forced to raise taxes even more to pay for considerably richer social benefits. Running as a democratic socialist, Sanders envisions making the United States more like European countries that cover a much broader set of services. Because the Sanders plan already maximizes tax increases on upper-income earners, any additional levies to pay for the shortfall would like fall on middle- and lower-income families, the authors said. A leading possibility would be a new national sales tax, a revenue-raising scheme used by other economically advanced countries with more extensive social benefits. “President Sanders would have to rely on much more broad-based taxes,” said economist Len Burman, director of the Tax Policy Center. The studies try to give a sense of winners and losers under Sanders’ proposals. All but the richest would come out ahead. Those in the middle of the income ladder — averaging about $41,000 in annual income — would gain nearly $8,700 on average because the new benefits would be worth more than the taxes they would pay. But households in the upper rungs — the top 5 percent averaging about $650,000 in annual income — would lose about $110,000 on average because the new taxes levied on them would exceed the value of benefits they would receive under the plan. 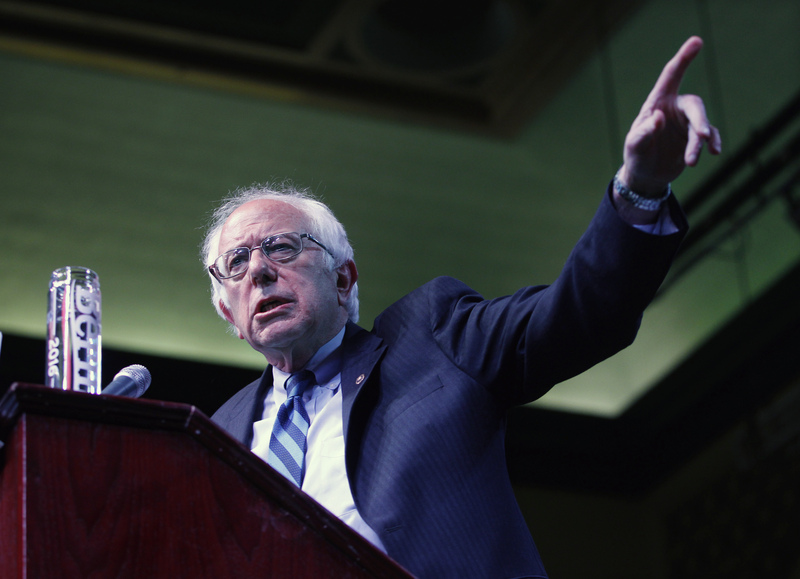 Health care is the most ambitious and costliest part of Sanders’ proposal. His new “single-payer” government-run health care system would incorporated all private insurance, Medicare, Medicaid, and President Barack Obama’s health coverage expansion into a new program. Everyone would be covered. There would be no insurance premiums, deductibles or copayments. Long-term care would be covered, as would most dental, vision and hearing care. “It would be significantly more generous than current-law Medicare or typical private insurance,” the analysis said. With more generous benefits, and without copayments and deductibles, the analysis projects that individuals would use more health care services, growing the nation’s overall health care tab. All told, the Sanders health care plan would cost about $32 trillion over 10 years. “Sanders would change what the government does for people in a very big way,” said economist Roberton Williams, a senior fellow at the Tax Policy Center.